How are human activities impacting animal movements? A global analysis of tracking data reveals that mammals move distances two to three times shorter in human-modified landscapes than they do in the wild. Our paper in Science can be found here. With 50 - 70% of the Earth’s surface currently modified by human activities such as agriculture and expanding infrastructure, ecosystems worldwide are being altered. In response, it is likely that mammals will have to change their movements in human-modified landscapes. Movement data of one species can provide useful information on how individuals are responding to small-scale changes, but if we are to truly understand the global impact of human activities on mammals, we need movement data across many species: a challenge that requires a huge international collaboration. The journey began back in 2014. A movement ecology meeting (AMOVEE) was held, where ecologists met to discuss the idea of combining multiple animal-tracking datasets. How and why animals move has long been of interest to ecologists, from migration to home ranging behaviour. Animal movement is not only important for animals themselves (e.g., for finding food or mates) but is also important for ecological functioning. 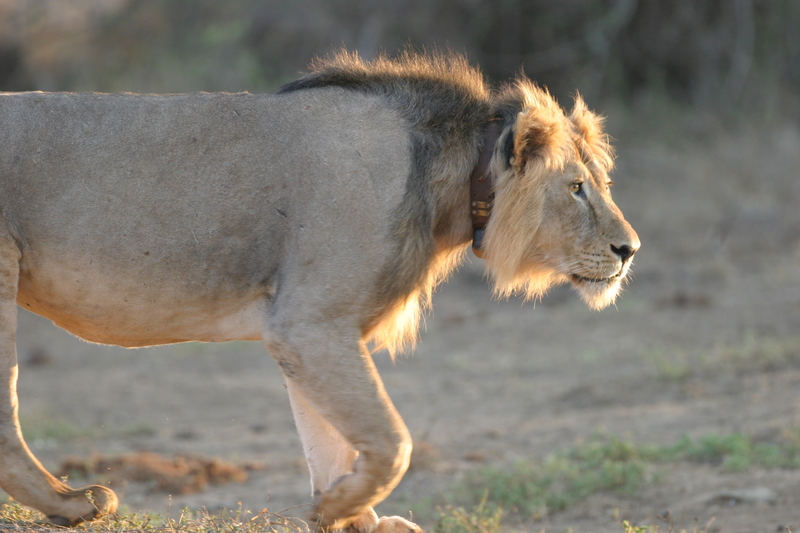 The development of Global Positioning System (GPS) tracking devices that can be attached to animals has enabled us to find out where they are going without having to physically follow them around all day. This has led to an explosion in the amount of animal tracking data that has been collected. I was very excited at the prospect of working with this data to build a more global perspective on animal movement, so I put my hand up to take the lead on this endeavour. With the assistance of Movebank, an online repository of animal tracking data, approximately one million emails* to more than 100 people, over 7 million data points, and just over 18 months later we had a tracking database of 57 terrestrial mammal species from across the globe. The next challenge was how to quantify human activities across the globe? 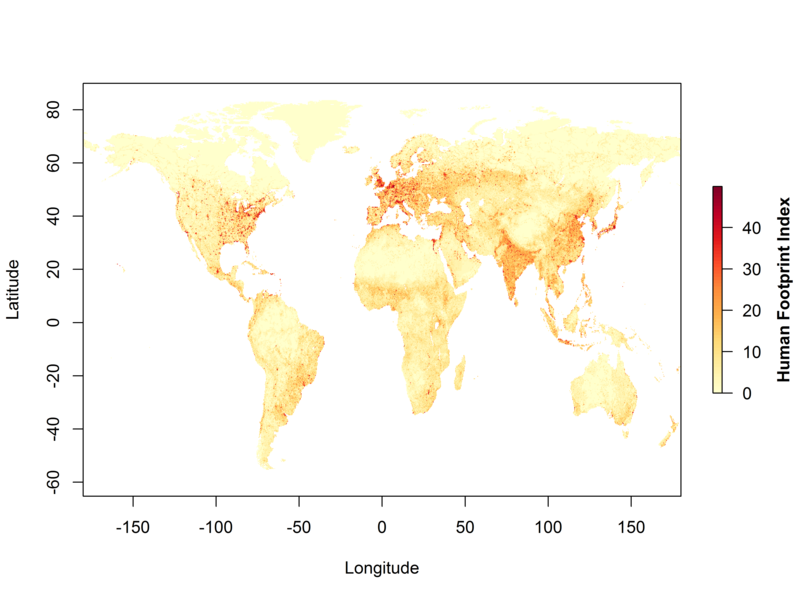 Luckily for us, a published and publicaly available global layer of the Human Footprint Index was available. This index is a combination of human influence proxies including built environments, crop land, pasture land, human population density, night-time lights, railways, roads, and navigable waterways. The Human Footprint Index ranges from 0 to 50, spanning wilderness areas such as the Brazilian Pantanal, to high density built environments such as New York City. The global map of the Human Footprint Index (HFI) spanning from 0 (low; yellow) to 50 (high; red). After a long process of data cleaning/preparation, discussions with collaborators and data analyses, we had our results. 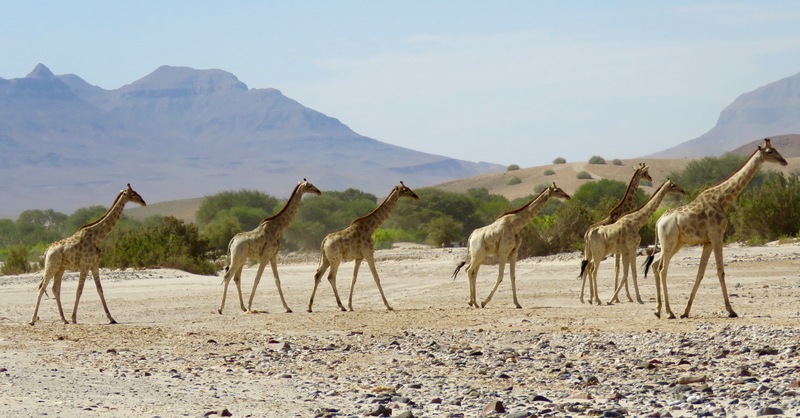 Mammals living in human-modified landscapes were moving less than mammals living in more natural areas. There are several possible causes of this reduction in movement. For example, barriers created via habitat fragmentation or infrastructure could physically prevent animals from moving. Another possibility is the increased abundance of resources such as crops or artificial water sources that reduce the need of mammals to travel longer distances. Also, the response of mammals may not only be behavioural, but some species may no longer occur in areas that are modified by humans, specifically those that exhibit long-range movements (e.g., migration). Overall, the response of mammals to human activities is complex, with multiple human activities often impacting individuals at the same time, as well as both species’ and individuals of the same species responding differently to humans depending on the context. I see this study as the first step to examining how humans are impacting animal movements. I believe future research should focus on examining the underlying causes and consequences of reduced movement with the goal to use this information to help develop conservation strategies. 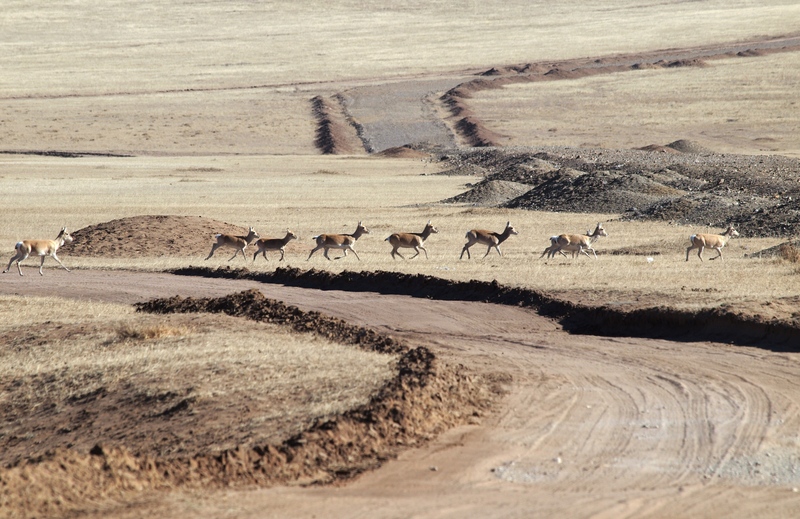 One key conservation goal is to maintain landscape connectivity enabling mammals to move unhindered. One example of this is the implementation of wildlife corridors that enable mammals to move between suitable habitats. It is important that land-use planning balances the needs of human activities with the needs of wildlife. Overall, this whole process has been an amazing experience and I have learnt a lot, from dealing with large datasets to handling MOU’s to keeping a very well organised** inbox. Working in large collaborations exposes you to a wide range of perspectives enabling you to think about things in a completely different way. ** Most of the time. Macroecology, movement ecology, mammals, body size.